Join this kitesurf camp! These are carefully selected packages to provide you a perfect week with lots of beach, sun, and activities. All packages include all kite equipment and are heavily discounted. These trips are available for everyone. So whether you are looking for a kitesurf camp for beginners or are a seasoned kiter that is looking for a thrilling adventure, this is for you! You will stay for seven nights at the Kitesurf Lodge. The ground floor is a big studio with eight dorm beds, kitchen, bathroom, table tennis, and doors that open directly to the pool. On the first floor, you can find the entrance to the Kitesurf Lodge. It holds three guest rooms, a kitchen, bathroom, and the shared living room. The second floor is the top floor of the kitesurf lodge. It holds a bathroom and the two biggest guest rooms which have a view over the lagoon. This kite surf camp is a holiday for beginners. In case you are an intermediate but not yet ready to kite independently, do not worry! Lessons will be provided that will fit your level and from the point you feel comfortable to go out by yourself, your course will be switched to something more fitting too. Since Kaj started kitesurfing in 2008, he was hooked to the sport and he knew that this would change his life. After having a small kitesurf school in the Netherlands he searched for an adventure and went on a road trip through Europe. He loves to kitesurf in Portugal and fell in love with this country. The nature, the food, the Portuguese culture and the perfect kitesurf conditions make the silver coast a true paradise. Jorginho is passionate about water sports and nature from a very small age. He has been a kite surfer since 2003, a kite instructor since 2008, and a manager of several schools in different countries. Now, he is in Portugal and managing his own kitesurf school in one of the best spots in Europe. Kitesurfing has been Jip’s hobby since the first few meters he made on a kiteboard. After discovering the endless possibilities within the sport, his passion for kitesurfing has grown larger and becoming an instructor is only a natural step for him. He was born and raised in a small town in Groningen, the Netherlands, but he is currently studying hotel and event management in Utrecht. 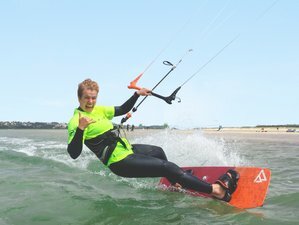 Doing an internship at the Kitesurf Lodge gives him the amazing opportunity to combine his study and his hobby. This surf camp will take place at Bairro, Portugal. The Kitesurf Lodge offers kitesurf camp holidays for all levels of surfers.